Preparing food at home includes simple tasks such as boiling water to cook pasta, complex tasks like preparing a stuffed pork roast, and family-fun tasks like making cookies and brownies for dessert. Whatever task you’re doing as a home chef, you need to understand the basic principles of proper food safety preparation to keep your food safe. How much do you enjoy making the food for your family and friends? Maybe you hate being in the kitchen. Maybe even the thought of boiling water scares you. Maybe you relish the challenge of tackling recipes and enjoy every minute in the kitchen, including the cleanup! Maybe you’re somewhere in between. Whatever your skills, interests, and enthusiasm, here are some basic guidelines to help keep your food safe during preparation. ANYONE can cook! Frances, a friend of mine, is willing to show you the tricks and tips to making you a GREAT HOME CHEF! Her web site, Painless Cooking will show you HOW to cook almost ANYTHING! It doesn’t matter whose fault that mess in the kitchen is; a dirty kitchen is not going to be safe to cook in. Some viruses can hang out on unclean surfaces for days (if not weeks). Always make sure that counter tops, pots, pans, knives, spoons, spatulas and all other equipment you use are properly clean first. Then, before you do a single bit of cooking, put all the cleaning chemicals away! Don’t have them near when you’re cooking. You wouldn’t want to add chemicals to your dinner. Then clean yourself. WASH YOUR HANDS! One of the best, safest things you can do for your food is to wash your hands regularly – before, during and after cooking. In this respect, do not follow the food gurus on the TV shows. Not long ago I watched an hour of food programming on national networks. I watched prominent chefs wipe their hands on their aprons instead of washing hands, use towels to dry their hands that they left sitting on the counters, and even touch their hair over and over while they cooked. Maybe celebrity cooks can do whatever they please, but those practices are not safe, whether you’re cooking for audiences or for yourself and your family! How do you wash your hands? It’s time to review what you were probably first taught when you were three years old. If you and your family understand and use proper procedures for washing your hands, you will not only improve food safety in your home, but (according to studies) you will also be healthier in general! We’re linking to a hand washing video – one created for restaurant employee training – for you to view here. Put your hands under hot running water – as hot as you can stand. Lather up your hands with soap, including your wrists and the backs of your hands (not just your palms). Scrub for 10-15 seconds. Many restaurants and health departments require 20 seconds, but recent studies have shown that 10 to 15 will work. Sing the Alphabet Song through once at a moderate tempo, and that should be time enough. Rinse off your hands and then dry them. It’s best to use a paper towel (as restaurant employees are required to do), but you’ll be OK if you use a clean kitchen towel at home. When first starting to work in the kitchen. What was the last thing you did before beginning to cook? Do you even remember? Was it coming in from the car, putting away groceries, checking e-mail, looking at this web site again? All those actions – and almost all others – put germs and other microorganisms on your fingers and hands. If you don’t wash them first, those germs will transfer to your salad, chicken, or other foods. After touching raw meat. We cook food because cooking makes it palatable to our systems, but it also makes the food safer; cooking kills germs that naturally live on or in raw meat. Those germs are also in the “juices” of the raw meat, and can transfer onto your hands. Unless you wash your hands after touching the meat, the juices on your hands will then transfer to whatever else you touch. If what you touch is a salad, vegetables, or other food item that may not be washed or cooked after touching, you may be adding nasty germs to those foods. Washing produce is such an important step, we've given it it's own page. Click here for proper food safety preparation for salads and lettuces.. But if you skip it, know that every produce that you prepare should be properly washed before you use it! Remember that germs, especially on raw meats and dairy products, like warmer temperatures (so store your food properly – click here). That’s why you keep your meat and milk in the fridge. If you pull out that meat (let’s say beef chuck for kabobs) and let it sit on the counter for 30 minutes as you fix the peppers, onions, and other ingredients, germs start to grow again. In a microwave. Does your microwave have a defrost setting? Learn how to use it. It can speed up the process of getting something ready for dinner or lunch. However, once the food is thawed, cook it as soon as you can. Don’t place it back in the refrigerator to use a few hours later; by cooling it back down slowly in the fridge, the food might come back into the TDZ for too long. As part of the cooking process. Some recipes (including crock-pot recipes) allow for frozen foods to be cooked from their frozen state. Some seafood, like shrimp, can also be cooked without thawing. However, it’s very important to check the final cooking temperature with a thermometer to ensure that the food has been cooked properly and is safe to eat. Check out more info on cooking here. In a water bath. This is called a “quick thaw” in restaurant terms. You place your food item in a pot or bowl, fill the bowl with COLD water (not hot), and let just a light trickle from the faucet hit the bowl. It is best to leave the food in the original packaging, if possible, to keep it from becoming waterlogged. If done correctly, the food should thaw enough to use in about an hour, but don’t keep it going for longer than two hours. It is also very important to use only cold water, below 70 ˚ F (21.1 ˚ C); hot water will start to cook the food and raise its temperature above 70 ˚ F (21.1 ˚ C). Part of preparation is cooking, of course. 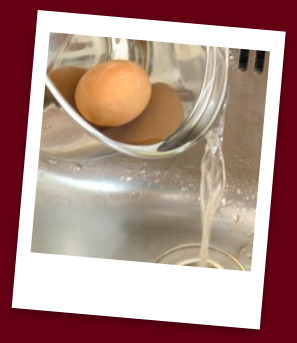 Cooking safety is so important that we’re going to make a whole separate page for it – click here. Just remember to use your cooking thermometer! One of the advantages of being the cook/chef is that you can taste-test the food… and if you are making cookies with your children, they will want to lick the bowl! There’s really not a problem with this – but if, in the tasting and testing, someone’s mouth germs get into the food, it could make a high risk person (click here for more info) very sick. The safest way to taste is to use a clean spoon or fork each time. Reusing the same utensil can transfer the normal germs of a healthy mouth to the food, which may be transferred to your family or guests and not be healthy for them. Occasionally I’m asked if I let my kids “lick the spoon” after making brownies or cookies, if the batter contains raw eggs. To be honest, I do. I do not encourage it, and I have a child who falls into a high risk population, but I do let my kids do it a little bit. There’s a slight risk, but I make sure that the eggs aren’t sitting out on the counter too long, and that all the other ingredients that ought to be cold are mixed cold as well. Once you’ve cooked something, either you’ll serve it right away or you’ll want to cool it and use it later. This is one of the riskiest steps in preparing foods. Restaurants know that failure to cool foods down properly is a major cause of food borne illness outbreaks (for more info, click here). Remember that germs like the Temperature Danger Zone (TDZ). When you cook, you take the food right through the TDZ to a temperature for safe cooking. Now, when you’re serving food or putting it back into the fridge as leftovers (or because it’s on tomorrow’s lunch menu, not today’s), you are bringing it back down through the TDZ again. While many bacteria and viruses die at proper cooking temperatures, some germs will survive. This second (or third or fourth) trip through the TDZ may allow these bacteria to go crazy. Pretty scary! Dispose of any foods that have been sitting at room temperature for more than two hours. Picnics, potlucks, Thanksgiving dinners and other social events involve foods that sometimes are out for a long time. Don’t risk it – if it has been sitting for two hours or more, trash it. After the meal, put the leftovers you’re going to save into containers with lids or freezer bags, and put them in the refrigerator (or ice chest, if you’re on a picnic). It’s also best to note on the package when you put it in or cooked it, so you know how long it can sit in the fridge. Check out our food storage info. In restaurants, large batches of soup and sauces are cooled down quickly using an ice bath. You can do this, too. An ice bath is created with ice and water (usually mostly ice) in a sink or large pot. Put your pot or container of soup/sauce inside, “swimming” in the ice. Stir the food every so often to help it cool faster – remember, the longer it sits in the TDZ, the more chances germs have to grow! One of the things my wife always wishes I understood better when I make Thanksgiving dinner for the family is the importance of cleaning up! (Aren’t there other web sites that tell how to get your spouse to do something that he/she doesn’t want to do?) Clean EVERYTHING – the dishes, the countertops, the floors, and the cooking equipment. Leaving cooking equipment dirty can lead to accidentally contaminating the food you cook next. Worst of all, if you don’t clean your kitchen thoroughly, you invite bugs, mice or other pests that will try to eat your food for you and transfer the germs they carry to your food. Bon appétit! Preparing and making food safely is important; while it’s fun to be in the kitchen, it’s also necessary to understand the risks. These basic ideas and principles apply to any food you’re working with. Plunking a frozen dinner into the microwave is one thing; cooking a four-course meal for your family and friends is another. Well, we purchased the food, we stored the food, we prepared the food, we cooked the food, and now we have to learn about leftovers! Hungry yet? If you’ve decided you’d rather go to a restaurant, click here for Red Flag warning signs you should know. If you’re interested in how the health department keeps an eye on everything, click here. To learn the history of food safety, click here. 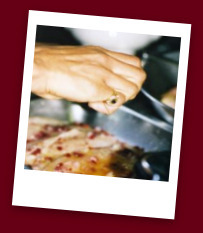 To check out Food-Safety-and-You.com's home page, click here.